On the eve of the game at FC Utd of Manchester tomorrow the Harriers have recruited a left sided full back to fill one of the positions that we are having problems with. Joel Taylor has arrived at Aggborough on a short term contract after having been with Stoke City for the last four seasons. 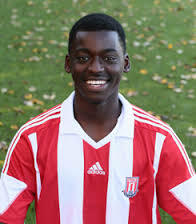 He was released from there at the end of last season even though he was given the Player of the Year award for Stoke’s U21 side. He made a few appearances for City in the Checkatrade Trophy and travelled with the first team for a couple of away games but never actually made a first team appearance for them. He spent time out on loan at Rochdale too but only made one appearance in his projected two months there but was re-called early due to lack of games. Joel will be included in the squad going to Manchester tomorrow.